'Preethi' one of the leading South Indian kitchen appliance brand was taken over by Philips to consolidate their business presence in the southern part of the country. 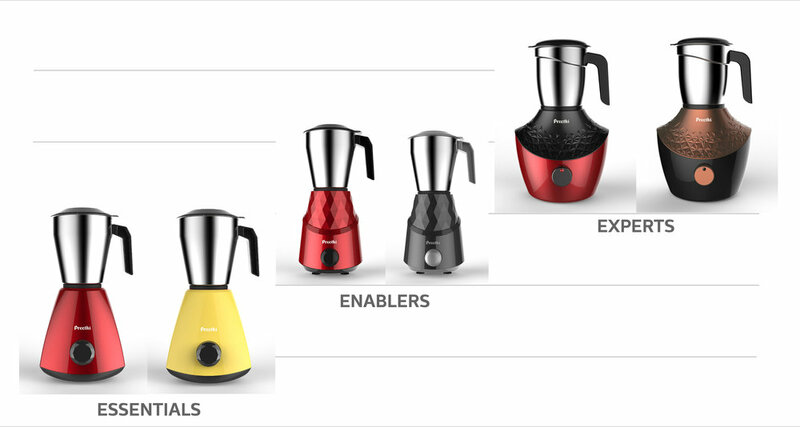 However, because it also played in the same appliance sector as Philips, it was imperative for Preethi to have its own unique design language and product positioning so that it does not cannibalize into the share of both the brands. As a team, we helped Preethi get its own design identity inspired by the unique culture and preference of people in Southern India. The project kick started with a joint workshop of all the stakeholders of Preethi & Philips to decide on the brand positioning, design & communications. Design being the anchor in the process. Extensive market surveys were done to understand competition products, their design language and current positioning of Brand Preethi. A thorough analysis was done of the Kitchen landscape in terms of Competition, Customer and Company to identify gaps and derive a design strategy. Understanding the brand and converting them into tangible design attributes.